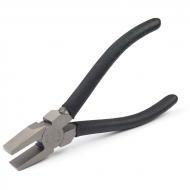 A lightweight, versatile breaking plier. We like them for removing rolled edges. Jaws are non-serrated. Coated handles offer superior grip. These are 6.5” in length and work well for most hand sizes.